Sunni Islam (/ˈsuːni, ˈsʊni/) is the largest denomination of Islam, followed by 75-90% of the world's Muslims, and is arguably the world's largest religious denomination. Its name comes from the word sunnah, referring to the behaviour of the Islamic prophet Muhammad. The differences between Sunni and Shia Muslims arose from a disagreement over the succession to Muhammad and subsequently acquired broader political significance, as well as theological and juridical dimensions. 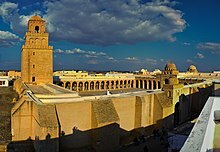 According to Sunni traditions, Muhammad did not clearly designate a successor and the Muslim community acted according to his sunnah in electing his father-in-law Abu Bakr as the first caliph. This contrasts with the Shia view, which holds that Muhammad announced at the event of Ghadir Khumm his son-in-law and cousin Ali ibn Abi Talib as his successor. Political tensions between Sunnis and Shias continued with varying intensity throughout Islamic history and they have been exacerbated in recent times by ethnic conflicts and the rise of Wahhabism. As of 2009[update], Sunni Muslims constituted 87–90% of the world's Muslim population. Sunni Islam is the world's largest religious denomination, followed by Catholicism. Its adherents are referred to in Arabic as ahl as-sunnah wa l-jamāʻah ("the people of the sunnah and the community") or ahl as-sunnah for short. In English, its doctrines and practices are sometimes called Sunnism, while adherents are known as Sunni Muslims, Sunnis, Sunnites and Ahlus Sunnah. Sunni Islam is sometimes referred to as "orthodox Islam". However, other scholars of Islam, such as John Burton believe that there is no such thing as "orthodox Islam". ^ a b c Tayeb El-Hibri, Maysam J. al Faruqi (2004). "Sunni Islam". In Philip Mattar. The Encyclopedia of the Modern Middle East and North Africa (Second ed.). MacMillan Reference. ^ a b Michael E. Marmura (2009). "Sunnī Islam". In John L. Esposito. Sunnī Islam. Historical Overview. The Oxford Encyclopedia of the Islamic World. Oxford: Oxford University Press. doi:10.1093/acref/9780195305135.001.0001. ISBN 9780195305135. (Subscription required (help)). Sunnī Muslims have thus referred to themselves as ahl al-sunnah wa al-jamāʿah (people of the sunnah and the community). ^ Abrahamov, Binyamin (2014). "Scripturalist and Traditionalist Theology". In Sabine Schmidtke. The Oxford Handbook of Islamic Theology. Oxford: Oxford University Press. (Subscription required (help)). ^ Blankinship, Khalid (2008). Tim Winter, ed. The early creed. The Cambridge Companion to Classical Islamic Theology. Cambridge University Press (Kindle edition). p. 53. ^ Hoover, Jon (2014). "Ḥanbalī Theology". In Sabine Schmidtke. The Oxford Handbook of Islamic Theology. 1. Oxford: Oxford University Press. p. 625. doi:10.1093/oxfordhb/9780199696703.001.0001. ISBN 9780199696703. Archived from the original on 2016-08-17. Retrieved 2016-08-02. (Subscription required (help)). This page was last edited on 14 April 2019, at 22:04 (UTC).